"I'm stunned," said Tarana Burke, the activist who originally coined the phrase "Me too" for survivors of sexual assault. With a guilty verdict in Bill Cosby's sexual assault trial on Thursday, a Pennsylvania jury handed down the first major legal victory of the #MeToo era. The verdict — convicting the once-revered comedian of three felony counts of aggravated indecent assault — came after Cosby's first trial ended in a hung jury last June, months before a sexual harassment reckoning swept Hollywood, the media, politics and other industries. "I'm stunned," Tarana Burke, the activist who originally coined the phrase "Me too" for survivors of sexual assault, told NBC News after Cosby's conviction. "I think, like most survivors around the world, I never expected to see anyone with accountability." She added that she felt a sense of relief for the dozens of women who spoke out against Cosby and "who came forward courageously to do a very difficult thing, which is to stand up in the face of power and celebrity to tell their truth." "I'm delighted for them," Burke said. All told, more than 60 women have accused Cosby of sexual misconduct. The statute of limitations had expired for all except one: Andrea Constand, who accused Cosby of drugging and molesting her at his Pennsylvania home in 2004. Cosby was charged in the case in 2015, and the three counts he was convicted of on Thursday stem from that encounter. Constand and a handful of other women testified at Cosby's retrial, each sharing similar stories of being wooed by the entertainer, who they alleged took advantage of them. Cosby, 80, said the encounters were consensual. The verdict bolsters the #MeToo movement and shows that women can be heard when they come forward, said Stefanie K. Johnson, an associate professor of management at the University of Colorado Boulder’s business school, who co-wrote an article in the Harvard Business Review exploring why women fail to report sexual harassment. "Women need to feel like their claims are going to be taken seriously and that justice will be served," Johnson said. "There’s really very little motivation to ever come forward, and I think that’s why sexual assault and sexual harassment persist." "I think it’s essentially setting a precedent for the other men who are in line to go to court to face sexual harassment. I think this was extremely important to have this verdict." "There are many other people in line to face trial," she added, referring to ongoing criminal investigations of alleged inappropriate behavior by Hollywood producer Harvey Weinstein, actor Kevin Spacey and others. Weinstein and Spacey have not been criminally charged. "It’s essentially setting a precedent for the other men who are in line to go to court," Johnson said of the Cosby case. "This was extremely important to have this verdict." Laura Palumbo, a spokeswoman for the National Sexual Violence Resource Center, attended Cosby's trial for a week and heard the accusers testify. She described the verdict as "a long-awaited symbolic victory for many survivors of sexual assault." "We have seen so much change in just recent months as thousands of individuals have come forward through the Me Too movement and really become a powerful chorus," she said. "And we hope that this gives a renewed sense of purpose for survivors." She said the case exemplified the challenges when accusations are years old but fall just within the statute of limitations, and predicted the case would have far-reaching implications. "It proved that despite the hurdles of trying a sexual assault case after many years when a case is not immediately reported that justice can still prevail," Palumbo said. 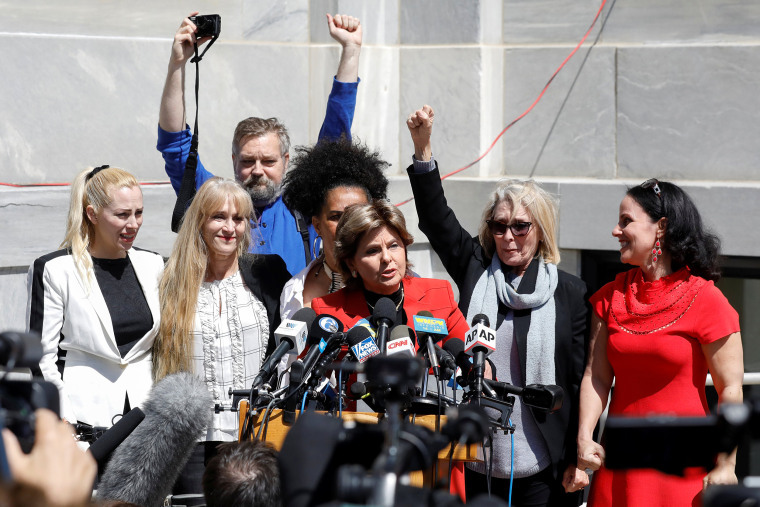 Attorney Gloria Allred, who represents several Cosby accusers, said she was glad to see women believed not only as part of the #MeToo movement "but in a court of law where they were under oath, where they testified truthfully, where they were attacked, where they were smeared, where they were denigrated, where there were attempts to discredit them." When asked if she felt she had played a part in helping Cosby's accusers be heard, Burke, the #MeToo founder, said it was a "humbling" question and added that many people helped the movement gain steam. "I’m just a person who stands up and tries to make sure we keep our focus on survivors and we keep our focus on the part of all of this that matters the most, which is the human lives that are affected," she said.